The ranking Republican on the Maryland State Board of Elections is calling for more transparency when staff investigates campaign finance violations that have the potential to be referred to the State Prosecutor’s Office. In March, state election staff cleared former Lt. Gov. Anthony Brown’s campaign of alleged campaign finance coordination during the 2014 gubernatorial primary election, but board members are still waiting for written documentation that supports the finding. “The parties and the public deserve to know the rationale for the board’s decision,” said State Board of Elections Vice Chair David McManus. McManus is proposing an amendment to election bylaws that would require board approval of any advisory memos related to campaign finance complaints. The board had no involvement with the investigation or the ruling in the Brown complaint. Republicans will gain majority rule of the board in July, when McManus is also expected to be voted in as chairman. The new makeup of the board will be three Republicans and two Democrats. Current state election law outlines responsibilities of the state board and the state elections administrator. There does not appear to be any language that addresses who at the State Board of Elections has the authority to investigate campaign finance complaints. State election staff did not respond to requests seeking clarity on the matter, or where in the bylaws the power is granted. 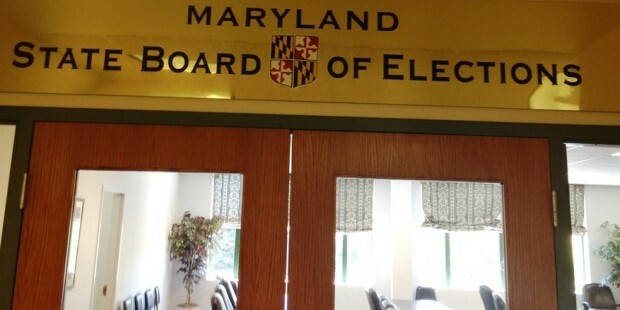 “When SBE receives a complaint, we perform an administrative review to determine if ​the complaint alleges a possible campaign finance violation,” Nikki Charlson, Maryland State Board of Elections deputy administrator, stated in an email. During an annual review of state election bylaws in April, McManus first proposed the amendment. But Democrats attending the meeting did not second the motion, so the amendment did not advance. Board member Charles Thomann, a Republican who also serves on the five-member election board, was absent. In turn, McManus did not provide the fourth vote needed for a supermajority to pass the bylaws. Each year, the State Board reviews the bylaws and votes on them. A supermajority vote of four board members is required to add amendments to the bylaws and to approve them. The complaint, filed last September by then-candidate Larry Hogan alleged that Brown’s chief fundraiser was coordinating with a super PAC that was supporting the Brown-Ulman campaign. The fundraiser, Martin-Lauer Associates LLC, was a consultant for Brown, Ken Ulman and the PAC, One State, One Future. The Hogan complaint cited criteria found in the state campaign finance guidelines that constituted potential coordination activities. Election board staff ruled no wrongdoing had occurred and staff did not recommend that the complaint be referred to the Office of the State Prosecutor for investigation. McManus’s amendment is expected to resurface at the board’s next scheduled meeting in June, when the bylaws are expected to be voted on again. After losing to Hogan in an historic upset last November, Brown is now running for Congress in Maryland’s 4th Congressional District. Political fundraising consultant Martin-Lauer Associates is now the chief fundraiser for Rep. Chris Van Hollen, D, who is running against 4th District Rep. Donna Edwards in the race to replace retiring U.S. Sen. Barbara Mikulski. Despite the board’s recommendation not to proceed with an investigation, “the state prosecutor has the authority to investigate any [state election law] complaint it receives,” Charlson said.